The goal of this paper is to provide the formal basis for a new approach to modelling the application of vague predicates like tall and bald to plural subjects like John and Mary and the men. In other words, we are interested in developing a new logical analysis for natural language sentences like Mary is tall and The men are bald. In the past 30 years, much research has been devoted to finding the proper logical framework to model the application of non-vague predicates to pluralities (cf. ,  among others). Additionally, there has been a lot of work on how to model the application of vague predicates to singular terms (cf. ,  among many others). However, the question of how to apply vague predicates to plural subjects and what complexities may arise in doing so has yet to be examined. This paper is a contribution to filling this gap. 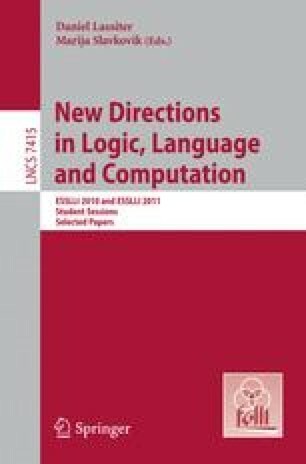 In particular, I argue that extending an analysis of predicate vagueness to incorporate pluralities is not immediately straightforward; that is, I show that sentences with vague predicates and certain kinds of plural subjects give rise to additional vague effects that are not present with singular subjects. Extending previous work on both plural predication and vague language, I propose a new logical system (Plural TCS) that models these effects. This research has been partially supported by a SSHRC doctoral grant to the author (#752-2007-2382) and the TELCAS grant (UCLA/École normale supérieure (Paris)) from the Partner University Fund. I thank Paul Égré, Thomas Graf, Ed Keenan, Friederike Moltmann, Dominique Sportiche, and Ed Stabler for helpful comments and discussion. Of course, all errors are my own.